Katie A. Campbell, E-RYT, owner/operator of Yoga Training (Touch) has been my personal yoga trainer for three years now, with private sessions twice a week. Before starting at YT(T) I'd had rewarding yoga classes. But beginning with the first session, Katie encouraged me to develop beyong those and progress as far as I can by offering advanced poses in balance, flexibility and strength, while persistently focusing on the proper form for each pose. I have progressed steadily and sgnificantly and I can truthfully say my body can achiee things few other 69-year-old bodies can. I've come a long way but most importantly, I never have any aches, pains or soreness. I attribute that to my practice at YT(T) with Katie. Katie focuses on therapeutic results for her clients. In my case, it's lessening a lordotic curve by lengthening the posterior muscles of the neck and building greater strength of the upper back muscles translating into more lift through the chest. Away from the studio, Katie has suggested modifications to old habits contributing to this neck/back issue. Now I walk, sit and stand more upright without effort - a very pleasant sensation I've never had before. Katie has a thorough knowledge of the body and how to apply yoga postures to correct and strengthen. YT(T) offers a wide variety of creative yoga sessions, (I have participated in) length from 45 minutes to two hours, including vinyasa (Power), (Strength with) weights, Aroma-Restorative, (Yoga)Run, Slow Flow, (and) Mysore. Katie schedules periodic assessments to evaluate clients' general health, needs for any specific therapeutic attention and progress in strength, flexibility and balance. Asana comprises only part of Katie's sessions. Yoga for Katie means all eight limbs and as our sessions have progressed, she has emphasized the full nature of yoga: for example, focusing on agreater energy center (chakra) awareness during savasana and at other times. It's clear that yoga is fundamental to her nature and she is herself, a solid argument for yoga's benefits - one of the strongest people I know and a vegan and owing to the example she sets with her own health and fitness, I have followed suit, with greater benefits an no regrets. I would recommend Katie and YT(T) fo yoga students of any level interested in a complete yoga practice that can continue to develop, to those interested in supplementing his/her other yoga classes with more advanced, challenging work and to anybody with specific muscular-skeletal issues, chronic aches and pains - which yoga therapy can, I believe, help to correct or relieve. Each of us owes ourselves (and our families and colleagues) an hour a week with Katie Campbell. As a newcomer to yoga, I was looking for someone who would gently work with me, explain the positions but also could recognize what I was capable of doing. It has been a fantastic experience -- not only is Katie extremely knowledgeable but it is inspiring to learn the moves, the breathing and see improvement with each week. And I feel more connected, flexible and capable. I wish this for each of you. I'm a type "A" personality willing to learn and driven to do things well. Therefore, my mind is often churning and working on something and when I participate in Yoga Training (Touch) Restoratives I relax. Going to "nowhere land" is wonderful, it helps my body relax. With a blank mind my body becomes limber - it's wonderful! 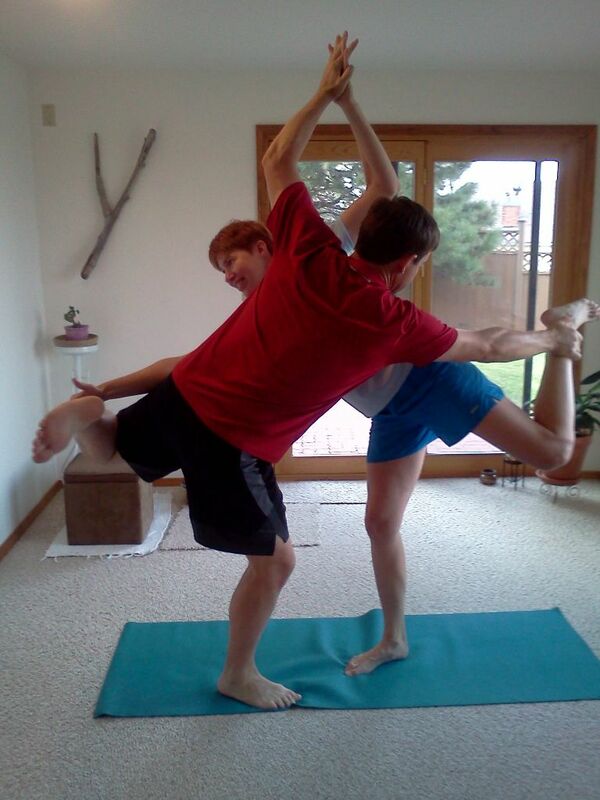 John and I recently relocated to Helena from NC and wanted to find a yoga instructor to work with us a s a couple. Katie was recommended to us and we have not been disappointed! She has developed a thoughtful practice that challenges us both at our individual levels and as a couple as well. Our strength, flexibility and balance have all improved without exception!